Back in late June, AMD announced a commercial version of the Ryzen product family. The Ryzen Pro series of processors levies the success of the Zen architecture and the Ryzen consumer products in hopes to make in-roads on the enormous market opportunity that commercial and managed enterprise desktop sales offer. The top three PC OEMs are on-board with AMD for the first time, bringing an air of credibility that previous commercial products lacked. While desktop PCs have been accused of having a quick descent into obscurity, the truth is that strong numbers continue to exist. In 2016, 51% of the commercial client computers sold were desktop machines (rather than notebooks) according to IDC metrics. That number is expected to drop to 50% in 2017 and to 49% in 2018. Even though it is shrinking, the market for commercial desktop processors remains significant. With an estimated value of $8 billion, and current market share of only 10-11%, AMD has a substantial opportunity for growth. AMD hopes to build off the success of the Ryzen consumer product launches and use that momentum to gain ground in the commercial space. Though there were early troubles from a platform perspective, the overall acceptance of the Ryzen 7/5/3 processors for the DIY and custom PC market was strong. 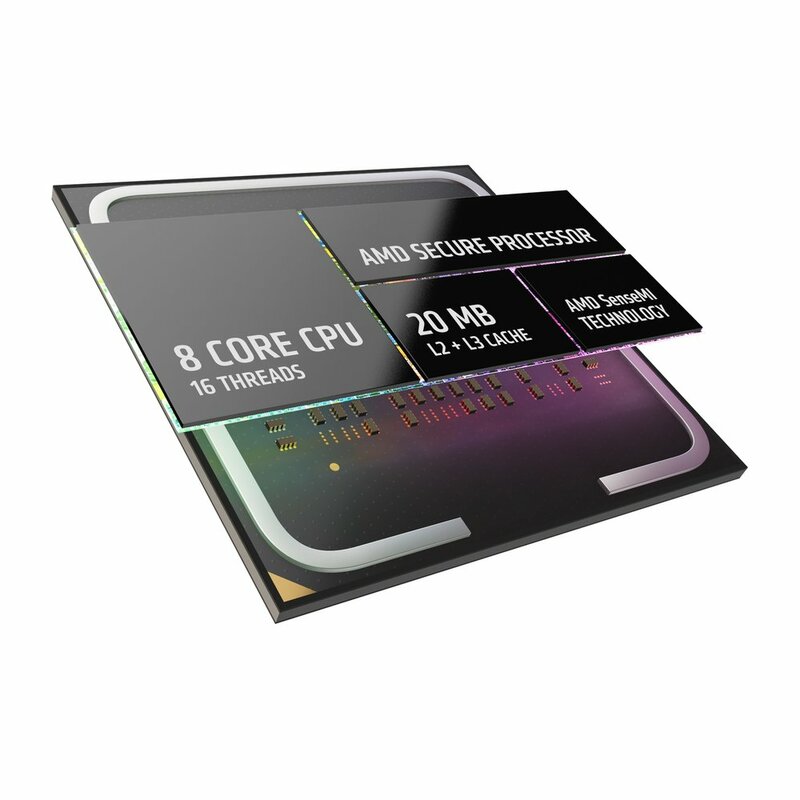 Reviews showcased the performance benefits of the increased core and thread count on AMD options against the price comparable Intel processors. Brand recognition and awareness are at a 10-year high for AMD’s processor division and that positive mind share can also be siphoned from to gain traction with the commercial markets that have pent up demand for competitive solutions that can help drive down costs and increase productivity. The commercial market for desktop PCs differs from the consumer space with requirements around security and manageability. Support for features like TPM 2.0 (Trusted Platform Module that integrates secure microcontrollers into devices) and hardware accelerated encryption are essential to a commercial platform. Manageability of remote systems is also key for businesses and the AMD DASH software stack allows for similar capabilities to ISM (Intel System Management) software. Top system OEMs I have talked with believe that AMD is finally up to the task of matching the requirements for large-scale enterprise reliability. The new Ryzen Pro processor uses the same underlying architecture that made Ryzen a success and will be offered in similar family breakdowns of 7, 5, and 3. Leaving detailed specifications aside, the Ryzen Pro family will offer more cores at every price and segment compared to the Intel Core series counterpart. More cores equates to better processing capability and improved performance, more quickly completing some of the most demanding tasks that enterprise and SMB customers face. In most benchmarks I have seen comparing Ryzen Pro to Intel Core i7/i5/i3, AMD will hold the advantage in key workloads like light video editing, basic content creation, and even large data set spreadsheets. AMD doesn’t want to talk about pricing advantages it might have compared to Intel’s vPro-enabled processors as agreements with OEMs vary pricing widely. Instead it is hanging its hat on the lack of forced differentiation throughout the entire Ryzen Pro family. Intel removes many of the security and manageability features of its lowest cost Core i3 commercial family to segment the market and offer up-sell options for IT buyers. AMD hopes it can take advantage of that by showing full security and manageability capabilities from Ryzen Pro 7 through the Ryzen Pro 3 (lowest cost) which makes purchasing and system deployment simpler. Even the lowest cost hardware will be able to fit into the corporate infrastructure that many commercial buyers require. More important than the AMD announcement are the OEM partner releases that will bring the Ryzen Pro processor to market. For the first time in AMD’s history, the three top selling PC vendors in the world were on hand to announce system availability for a commercial product. Dell, HP, and Lenovo will have systems available in September starting in the $600 price range and up, based on configuration. AMD’s current Ryzen Pro systems will require the inclusion of a separate, discrete graphics add-in card as the CPU does not include an integrated graphics solution. While this does put the Ryzen Pro systems in a slightly higher price bracket, it gives AMD another opportunity for graphics sales.